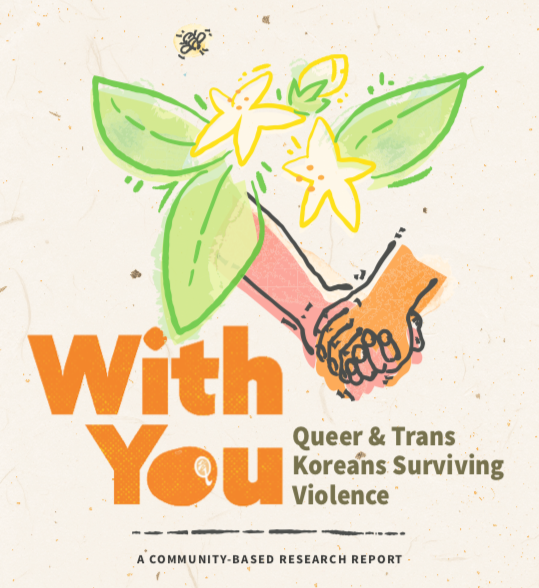 With You: Queer and Trans Koreans Surviving Violence (2018) is a community-based research report about queer and trans Korean Americans and abuse [family violence, intimate partner violence]. It is also an effort to document and reflect on our own experiences. It is important for us to document especially because we are often excluded from both Korean community as well as mainstream conversations on domestic violence. We hope this report will help more queer and trans Korean survivors feel less alone and receive the kinds of support that they deserve. 위드유: 한인 퀴어/트랜스 폭력 생존자 경험을 중심으로 한 연구서 (2018)는 퀴어/트랜스 재미교포들이 경험하는 학대 (가정폭력, 연인폭력)를 다른 연구 보고서 입니다. 또한 이 보고서는 우리의 경험을 기록하고 반영하기 위한 노력입니다. 한인 퀴어/트랜스 폭력 생존자 경험에 대한 기록 및 정보는 가정폭력에 관한 미국 내 주류 담론 뿐만이 아니라 한인 커뮤니티에서도 종종 제외된다는 점에서 이 보고서는 중요합니다. 이 보고서가 퀴어/트랜스 한인 생존자들이 덜 외로울 수 있게, 또한 필요한 서포트를 받을 수 있도록 하는 일에 보탬이 되길 바랍니다. Explore the reports below in both English and Korean! 아래의 보고서를 영어와 한국어로 살펴보세요!